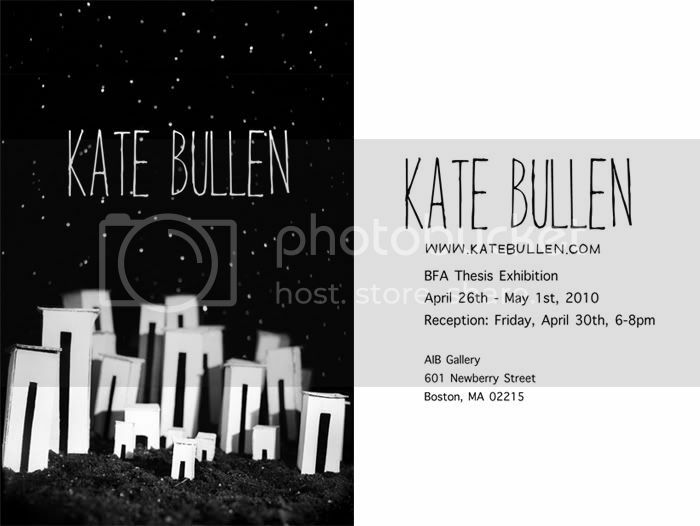 Kate Bullen: My senior show is just around the corner! My senior show is just around the corner! I am extremely pleased to announce the date of my BFA thesis exhibition opening. The show will be up from April 26th, 2010, to May 1st, 2010. The opening reception will take place April 30th, 2010, from 6pm to 8pm. Wine and hors d'oeuvres will be served (I'm also thinking about making a bundle of cupcakes!). The show is located at the AIB Gallery at 601 Newbury Street in Boston, MA. I am presenting work along with three of my peers- Liz Affa, Tiffany Ulrich, and Malin Sjoberg. They are all very talented women and I am proud to be showing alongside them. Please stop by if you can!